Is Bark a valuable use of bytes? No matter how your music is made or what it´s played through, it always ends up at the same place - your ears. 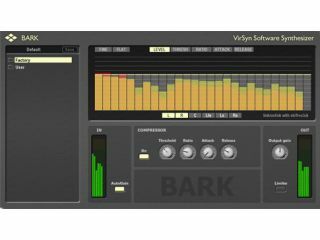 So, German software developer VirSyn has taken the logical step of releasing a filter plug-in, known as Bark, that´s modelled on the way the ear receives audio information. Bark comprises a filter bank that features 27 band-pass filters - these are said to match the ear´s ‘critical bandwidth´. There´s also a compression algorithm that´s designed to replicate the compression system that you´ll find in your lugs. Bark is available now for Mac and PC in Audio Units, RTAS and VST 3 formats. The full price is €169, though it´s available for €99 until June 30 2008. A fully working demo version is also being offered - you´ll find it at the VirSyn website.